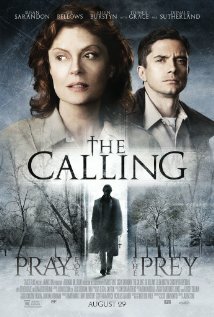 Check Out Trailer For ‘The Calling’!!! I love a good serial killer movie and I am so excited to see ‘The Calling‘! It could be because it stars Susan Sarandon. She has been one of my favorite actresses since ‘Rocky Horror Picture Show‘ in 1975. Hey, I didn’t see it until much later because I wasn’t even born when it came out, so I’m not THAT old, but that doesn’t take away the fact that I loved her as the trusting, naive Janet. She was remarkable as the passionate Reggie Love in ‘The Client‘ and totally hilarious, genuine and all around lovely as the recently widowed Hollie Baylor in my favorite Cameron Crowe effort ‘Elizabethtown‘. So if you take the combination of Sarandon, serial killers and throw in some Ellen Burstyn, Topher Grace and Donald Sutherland, this becomes a recipe for what I hope will be one of my new favorite films. The plot for ‘The Calling‘ plays out like this: Small-town Canadian sheriff detective Hazel Micallef has had an easy go of things in the sleepy little town of Fort Dundas. Things get very active with a string of gruesome murders that brings her face to face with a religiously motivated serial killer. An indie thriller directed by Jason Stone and adapted from Inger Ash Wolfe’s novel. So check out the new trailer below and then peep the movie when it opens on August 29. Check Out The Awesome Trailer for ‘Interstellar’!! This entry was posted on Monday, August 18th, 2014 at 6:08 am	and is filed under Books, Film, News. You can follow any responses to this entry through the RSS 2.0 feed. You can skip to the end and leave a response. Pinging is currently not allowed. « Paul Giamatti Heading ‘Straight Outta Compton’!! !